Melt butter and get it cooling. Beat the eggs and the sugar together until light and fluffy. Add the orange/lemon zest and vanilla and mix till well combined. Sift the flour and baking powder onto the egg mixture, and mix. Stir in the melted, cooled butter. Let the batter sit for 5 minutes. Spoon into your madeleine mold. Donít overfill them. 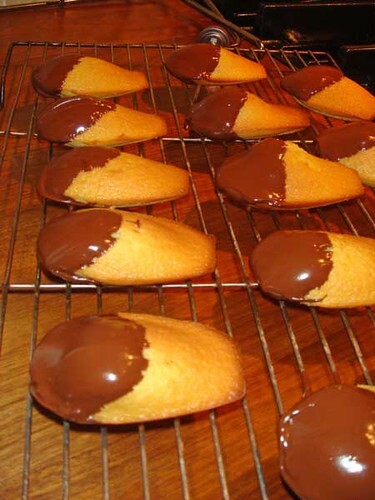 Bake for 8 to 12 minutes, depending the size of your madeleines. The edges should be a golden brown. Allow to cool before dipping in the chocolate.